Following a complete refurbishment, our uniquely styled ‘Premium’ and ‘Classic’ Rooms offer comfort with a modern twist on a traditional style. Rooms are situated in the main Georgian building, the Garden Lodge, and the Coach House. 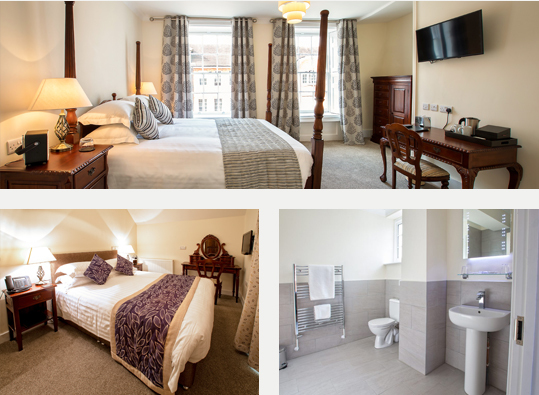 Whether you are travelling on business, attending a social occasion, or just looking to relax in this delightful town, we look forward to welcoming you to The Bishop’s Table Hotel. Luxury mattress ‘The best night’s sleep’ according to guests. Ensuite ‘Monsoon’ shower or bath with shower. Free Wifi, digital freeview TV, USB charger, DAB Bluetooth Radio/ Alarm. Premium teas, coffee, hot chocolate & biscuits. Complementary Continental Breakfast when booking direct. Four ‘Premium Rooms’ offering additional space and traditional feel. These rooms have King Size mahogany poster or sleigh beds. 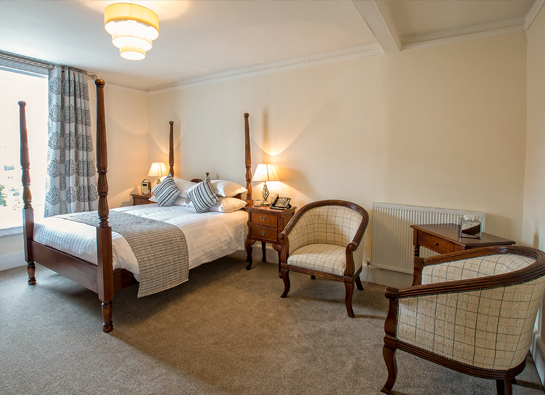 Seventeen well appointed ‘Classic Rooms’ with mix of modern and traditional furnishings. Two Single Rooms offering comfortable bijou accommodation for the single traveller with no compromise on style. The Main Hotel is a fine listed Georgian building, fully restored, and facing West Street in Farnham, whilst also enjoying a rear southerly aspect over our gardens. The Coach House is a unique historical building a short step from the main hotel. A single room and a double room are situated on the first floor making this an ideal cosy and quiet setting. The detached Garden Lodge houses six new rooms set within the gardens.